Like many people in the Baby Bust generation, I grew up on dry, boxed cereal. Sure, my mom would make bacon and eggs, waffles or even homemade donuts on weekends or other special occasions, but for the most part, we ate a vast array of sugar-coated and very tasty cereal with brightly colored boxes and even some cool toys. Cereal was the very first processed food that was designed to make eating easier — not necessarily healthier. After all, cereal requires no preparation or cooking. Cereal made it possible for moms to feed her family and get ready for work herself. But at what cost? Catchy, fun and oh so alluring, food manufacturers have never skimped on their budget when it comes to cereal ads. As a kid, I can remember choosing my weekly cereal solely on the advertisements. Millions of dollars are spent annually on advertisements that not only aggressively target children but also convince adults that dry cereals are a healthy and economical food choice. There are contests, online games, celebrity endorsements and catchy jingles to draw us in. Of course, none of us have time, as the advertisers would like us to think, to prepare real food for our family. Why would we if there is a packaged wonder like dry cereal that can provide all of the nutrients we need to get our day started? If only this were true. In reality, cereal is merely a smart packaging of some really cheap commodities like sugar and corn mixed with some even cheaper additives like artificial flavors and colors. Don’t be fooled! These highly processed food fakes have no real nutrients. Most are even sprayed with vitamins and minerals, and sometimes fortified with protein. You may be familiar with attractive claims on cereal boxes stating such as “All Natural,” “Low Fat,” “Essential Vitamins,” “Good Source of Vitamin A” and more. 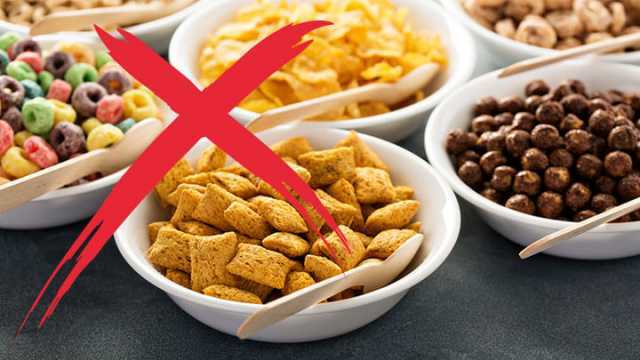 Even these so-called “healthy” cereals are loaded with synthetic and even toxic additives that make them no more fit for a dog’s bowl than your breakfast table. Dry cereal likely contains GMOs and unhealthy additives. According to the USDA, the following represents a total percentage of genetically modified cotton, soybean, sugar beet, canola and corn crops grown in the U.S.
What’s worse, some food manufacturers even acknowledge that they use genetically modified ingredients. Note: As of February 2015, General Mills has spent over $3.6 million to fight GMO labeling initiatives in the U.S.
“We do not require or exclude the use of these ingredients, so we don’t require our suppliers to provide this information. As a result, we cannot give you a definitive yes or no answer. That said, we’re glad for the chance to provide some clarification about genetically modified ingredients. When it comes to safety, the FDA has determined that foods developed through this process are no different than foods developed by traditional plant breeding. And in fact they conclude that these Genetically Modified foods don’t differ from other foods in any meaningful way. Finally, all of our products (worldwide) comply with all applicable food laws and labeling requirements. Note: As of February 2015, Quaker’s parent company, Pepsico, has spent over $8.8 million to fight GMO labeling initiatives in the U.S.
Kellogg’s representatives also sent an email to Food Babe regarding their use of GMO’s. Note: As of February 2015, Kellogg’s had spent over $1.8 million to battle GMO labeling initiatives in the U.S. This sickeningly sweet concoction leads the EWG’s list of “10 Worst Children’s Cereals” based on sugar content alone. This cereal is comprised of a whopping 56 percent sugar by weight. Honey Smacks also contain trans fats in the form of hydrogenated or partially hydrogenated soybean oil. This is listed in the ingredients, but not calculated into the fat percentage on the nutrition label. A few years ago, the FDA decided that trans fat content only needs to be listed if the food contains 0.5 grams or more per serving. If trans fats are included, but in less than this concentration, it can be listed as zero percent. This is absolutely egregious because, as we all know, servings add up. Another ingredient featured in Honey Smacks is BHT or butylated hydroxytoluene. Used as a preservative, BHT is also used in jet fuel, petroleum products, rubber and embalming fluid. It also shares chemical properties with toluene, a highly toxic solvent that has been linked to neurological problems when inhaled. If this weren’t enough, Honey Smacks have less than one gram of fiber. 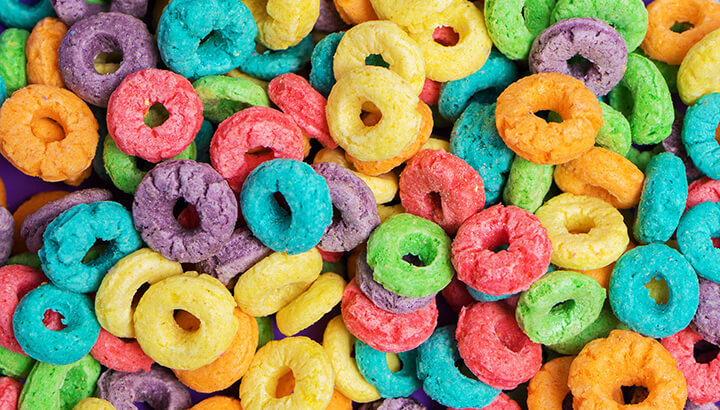 Fruit Loops cereal contains 41.1 percent sugar by weight. The very first ingredient on the nutrition label on a box of Froot Loops is sugar. In fact, this cereal weighs in at 41.4 percent sugar by weight. Froot Loops also contains trans fat and BHT. It does have several “natural fruit flavors,” but there is absolutely no real fruit. Froot Loops is, in fact, a rainbow of artificial colorings: red 40, blue 1 and 2, and yellow 6, to be specific. Artificial colorings have been linked to hyperactivity in children by multiple studies. They are potential triggers of mild to severe allergic reactions, especially in those sensitive to aspirin. Additionally, blue 2 has been linked to cancer in lab rats in some experiments. Red 40 is under investigation by some researchers as a possible carcinogen. Yellow 6 has been linked by some studies to cancer of the adrenals and kidneys, and also to digestive issues. One other potentially harmful — and untested — component of Froot Loops: GMO corn. 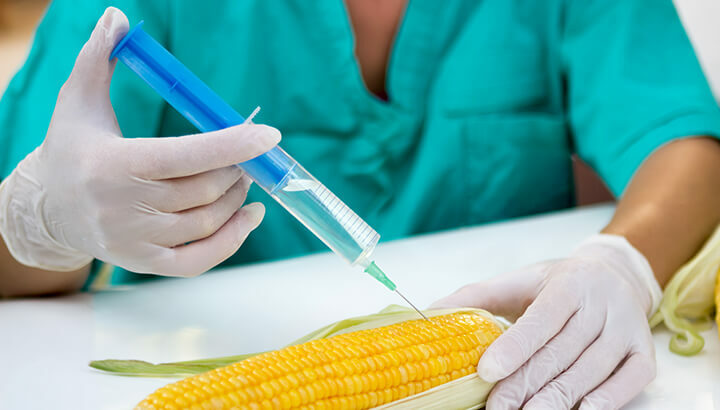 As 85 percent of the corn and soy grown in the United States today is genetically modified, products containing non-organic corn are very often made of GMO varieties. Sugar, not apples, is the first ingredient in Apple Jacks, followed by corn flour (most probably GMO), wheat flour (possibly GMO), oat flour, more sugar in the form of high fructose corn syrup, then salt. While apple juice and dried apples are included, the pesticides that non-organic apples introduce in the mix could outweigh the health benefits of the fruit. Apple Jacks contains 42.9 percent sugar by weight, less than one gram of fiber, and nearly 130 grams of sodium per serving. Apple Jacks also contain BHT, blue 1 and red 40. Coming in at second place on the EWG’s “10 Worst Children’s Cereals List,” Golden Crisp is 51.9 percent sugar by weight. It also contains trans fat (even if the label says zero), caramel color and almost no fiber. You are far better off to have a piece of real French toast drizzled with organic maple syrup than you are to have a bowl of this sugary mess. This cereal gets 40 percent of its calories from sugar and contains processed corn syrup, refined syrup plus flavor and color additives. Right away, you should know that this is not going to go well — this cereal is named after a candy that is packed with sugar and useless calories. This cereal is just a slight improvement over the peanut butter cup. However, it contains yellow 5 and 6. In addition, 33 percent of all calories in this cereal come from sugar. 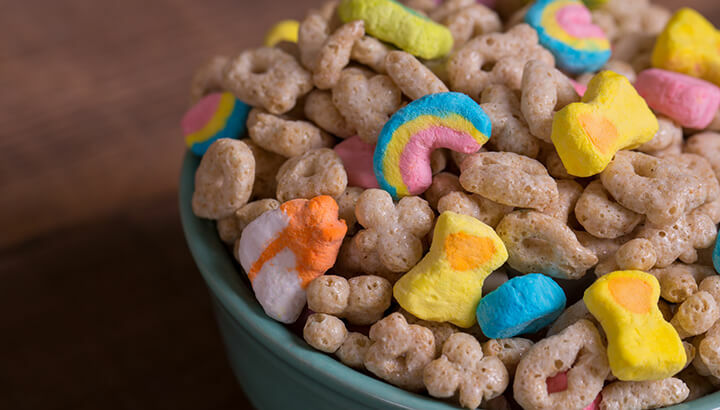 Lucky Charms cereal contains sugar, modified corn starch, corn syrup and more. These so-called magically delicious charms are not so lucky after all. Lucky Charms may have whole grains as the first ingredient, but this is quickly followed by marshmallows (a.k.a. sugar), modified corn starch, corn syrup, dextrose, gelatin, artificial dyes and flavors. Just one cup of these unlucky charms will provide the American Heart Association’s daily added sugar limit for one day. As you can see, it has next to no nutritional goodness. Rice Krispies made the list because they are often seen as a “healthier” option due to the significantly lower sugar content. While it is true that Rice Krispies won’t spike blood sugar like many other cereals, it is anything but healthy. It contains trans fats, BHT, soy ingredients, possible GMO grains and absolutely no fiber. Yes, Raisin Bran may be the best of the worst but that is not really saying much. It contains 18 grams of sugar and 46 grams of carbohydrates. In total, 38 percent of all calories in this cereal come from sugar. Kellogg’s is responsible for this fake peanut butter breakfast catastrophe. With 40 percent of all calories coming from sugar, this cereal also contains hydrogenated vegetable oil. 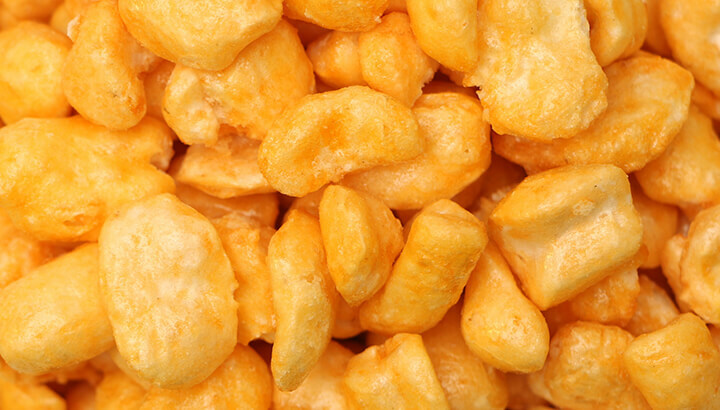 Corn Pops cereal contains dangerous hydrogenated oils. A Kellogg’s favorite, Corn Pops don’t have any fat and less than 10 grams for sugar, but they contain very dangerous hydrogenated oils. These are known to cause elevated bad cholesterol, strokes and even heart attacks. To give the pops their lovely golden shade, Annatto is used. Although this is considered a natural dye, studies have shown that this dye can cause just as many allergic reactions as synthetic dyes. Of course, the best possible option for all meals is to eat real, whole and organic food. Although it may take a few minutes to prepare, real food is loaded with nutrients that your body needs to thrive. It is worth it every time! Hey Buddy!, I found this information for you: "Never Eat These 11 Dry Cereals — Here’s Why". Here is the website link: https://www.thealternativedaily.com/reasons-to-avoid-dry-cereal/. Thank you.